You guys have been asking and asking and it's here!!! 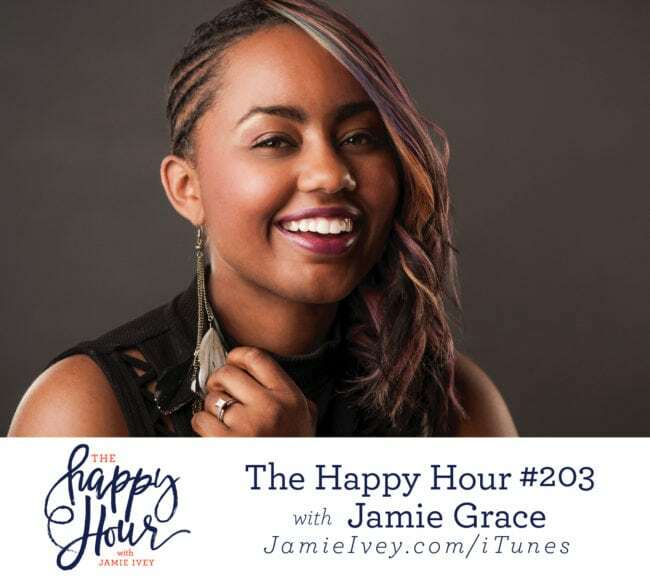 On this week's show I get to talk with the amazing Jamie Grace and I know you are going to love this Happy Hour. Jamie and I jump in and start talking about how it all started - she tells us about when she was 14 years old, she posted a video on YouTube as a way to channel her energy and creativity. Between the ages of 9 -13 years old, Jamie struggled with her emotions, friendships, and the diagnoses of Tourette Syndrome OCD, ADHD, and Anxiety. She realized creative outlets were a path to freedom and discovery about God's purpose for her, and how she could rebuild her life. Of course, I had to ask her what her parents thought of her posting videos on YouTube when she was just 14! Jamie tells us how they immediately shut it down, but that when they rebooted it, and to this day, her parents are her managers! In the last part of the show, we get to hear the love story of Jamie and her husband Aaron. You're going to love hearing her describe how she knew she was going to marry him the night she met him (even though she didn't even get his name! ), and how they didn't reconnect for a year! As many of you know, Jamie has shared so much on being single and living in a season of waiting, such as on her podcast Wait It Out, and she talks openly about what was challenging. Jamie reminds us that no matter what your season of waiting is for, and no matter what the outcome, we can remind ourselves and each other of the joy, peace, and promises that God has for us. What Jamie's loving: marriage and the grace Aaron gives her, and black beans! Last chance to join the Happy Hour Summer Book Club!